NEW YORK -- When it comes to pitching matchups, it simply doesn't get better than this. A lumberjack with a postseason record virtually unmatched in major league history against a guy nicknamed Thor, who throws in the upper 90s with a slider in the low 90s. It's 6-foot-5, 250 pounds against 6-foot-6, 240 pounds. Two huge guys, both as mean as a snake, facing off in a winner-takes-all game for teams that, at least a few weeks ago, weren't sure they'd be here. But the San Francisco Giants and New York Mets made it, and each enters the National League wild-card game with momentum. How good is Madison Bumgarner this time of year? His road ERA in the postseason is 0.60, the lowest of any pitcher in baseball history with at least 25 innings. The next five on the list are Bob Gibson (0.97), Mariano Rivera (1.02), Sandy Koufax (1.04), Lefty Grove (1.11) and Christy Mathewson (1.13). Bumgarner has made seven appearances on the road in his postseason career, and the Giants are 7-0. The last time we saw Bumgarner in the postseason, he pitched five scoreless innings in relief in Game 7 of the 2014 World Series in Kansas City. The last time we saw him this year, he was standing on the field at AT&T Park in San Francisco after the Giants clinched the second wild card, with the look of, "We will be back here soon." How good is Noah Syndergaard? How hot is the Mets' offense? They were once 60-62, 5 1/2 games out of the wild card with three teams to jump. They seemingly had no shot to make the playoffs but finished with the best record in baseball over the last 40 games, 27-13, to win the first wild card. They have done this, in part, with surprising pitching from young starters Seth Lugo and Robert Gsellman, but mostly they have done this by scoring a lot of runs. The Mets did indeed have the lowest batting average (.225) in the major leagues this year with runners in scoring position, led by Curtis Granderson, whose .152 mark was the lowest among qualifiers. But he got four hits in his last seven at-bats in those situations, and as a team, the Mets got a lot of big hits down the stretch. Asdrubal Cabrera and Yoenis Cespedes were the primary carriers, but the whole team contributed, including new second baseman T.J. Rivera ("wherever I've seen that kid, he has hit,'' one scout said) and now, Jay Bruce. After a horrendous start to his career in New York, Bruce has 12 hits and four home runs in his last 25 at-bats. Has the Giants' offense finally awakened? The Giants were shut out nine times the second half of the season, but in a very small sample, things turned the final week of the season. In their final four games, they outscored their opponents 26-6 to win the second wild card. 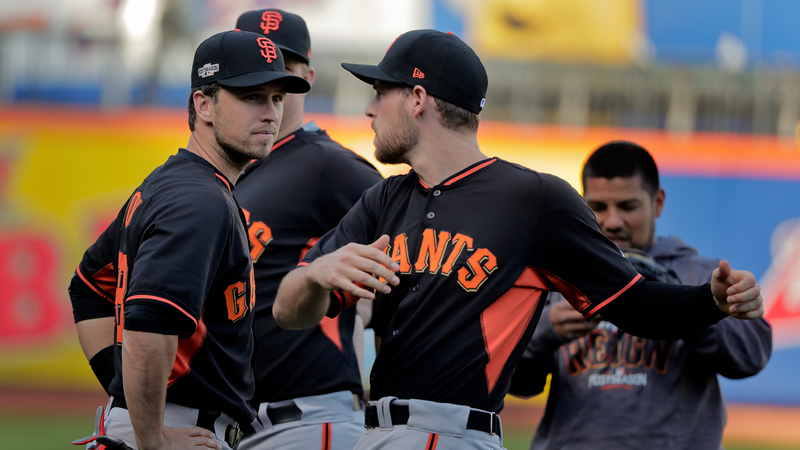 The Giants don't have a primary player with a .290 average or 20 homers and 85 RBIs, but their core position players are finally healthy, and it's not wise to underestimate Buster Posey, Hunter Pence, Brandon Crawford or any of the Giants this time of year. They always get big hits. What is the momentum, or the mojo, like for each team? The Giants are rolling, even if it's only for four games. They have this belief that no one can beat them this time of year, and they are starting to play that way. The perfect example was the crucial game last Saturday when left-hander Ty Blach, making his fourth career appearance and second start, beat the game's best pitcher, Clayton Kershaw, 3-0. And then there are the Mets. They were swept by the Braves Sept. 19-21, losing the last game 4-3 when Cespedes had a walk-off homer taken away with two outs in the ninth on a spectacular catch by center fielder Ender Inciarte. But the next day, the Mets, for the first time in club history, won a game (9-8 over the Phillies) in which they trailed by multiple runs in both the ninth inning and in extra innings. They became the only team in history to win a game by erasing multirun deficits in both of those situations, each with a home run. They have played like mad men since, making this matchup with the Giants one for the books.